These model/viewer classes are used when you want to design a frame that contains a tree view that shows all the levels of a data set hierarchy. 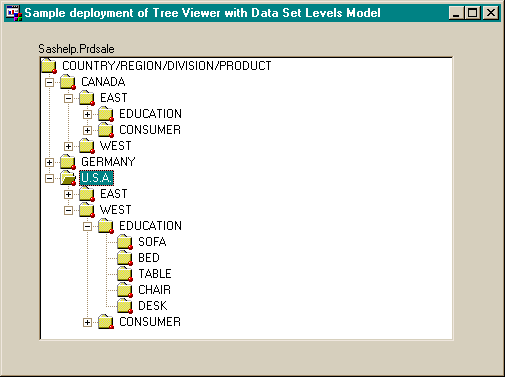 These model/viewer classes can be used in a SAS/AF frame by installing the classes and adding the Tree Viewer Control and Data Set Levels as Tree View Nodes Model classes to the Components tab. To instantiate the class during build, drag the class from the components tab and drop it into a frame. Note: During build you typically drag a viewer onto the frame and a model onto the viewer. For some reason, subclasses of the Tree View Control do not automatically hookup the model and viewer. You will have to drag each component to the frame and make the hookup manually. The classes contains these attributes that should be edited for each specific use. Special Note: Each node delivered by the model contains a userData item of type list. 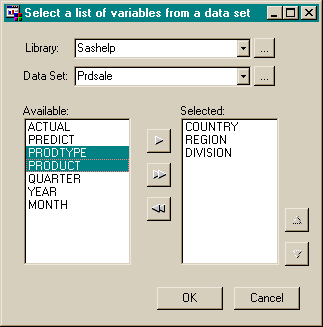 The list contains all contributing raw data values for a given formatted value shown in a node. This information is handy when implementing context processing on a node click. There are eight catalog entries that are designed to be installed in the catalog common.components. The components for use in build are treeviewer_c and datasetlevels_c. The use of these classes can be made more visually appealing by allowing the developer to control what open and closed icons are to be shown at each node. A method getNodeIcon (with arguments supplying the dataset name, level variable and depth, and value of variable) will be added as a hook for context sensitive icons. The developer will override this method and based on the inputs, return which icons should be used. Example use: Suppose you had a furniture level with values chairs, tables, and beds. The getNodeIcon method would return the icon number for a chair, table or bed. Asynchronous population of the tree view. If the Data Set is tremendously large, it is unconscionable to make a user wait while the model reads the entire table. The tree view should be updated every 1 or 2 seconds, or every N levels encountered. This one is going to take some hard thinking and probably dead end at non-existence of AF manageable threads in a SAS session. The customizer is a frame, it would be a nice reuseable component (common.components.variableselector_c.class) if the functionality was placed within a composite class. The customizer would then be converted to a frame containing only this new component. This page was last updated 13 December 2001. It would also be useful to provide a related mechanism for navigating a set of relational, rather than purely hierarchical tables, to represent the rows of the tables as objects, and to allow navigation between rows/objects/tables based on foreign key constraint definitions.